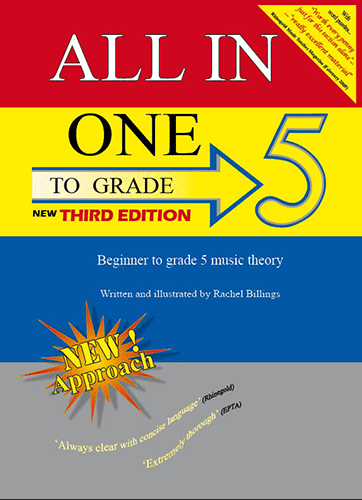 A fast track from Beginner to Grade 5 music theory (278 Pages) by Rachel Billings. 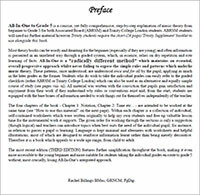 Download this book’s preface in PDF format by clicking the image above. Beginner to Grade 5 music theory (278 Pages) by Rachel Billings. ENDORSED by Victoria College of Music (All-In-One is “Best Music Theory” in their opinion). Read more here Covers all topics found in the new ABRSM 2018 syllabus, Trinity College London (and forthcoming Victoria College of Music) syllabus, plus more besides. All-In-One…and ONE for all! For every musician, young or old. 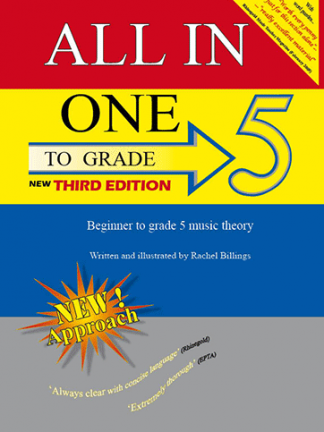 All-In-One to Grade 5 is a concise, yet fully comprehensive, step-by step explanation of music theory from beginner to Grade 5 for both Associated Board (suitable for ABRSM 2018 syllabus) and Trinity College London students. 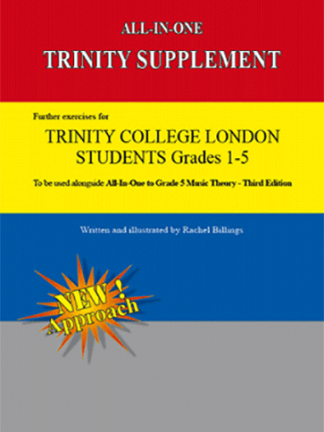 ABRSM students will need no further material however Trinity students require the short (26 page) ‘Trinity Supplement’ booklet (available on our website here) to use alongside this book . Appeals to a wide age range from young a child to adult, pianist and instrumentalist alike. A valuable fast-track to grade 5 music theory required by exam boards, colleges and universities. Covers all topics found in the new ABRSM 2018 syllabus, Trinity College London syllabus (and more besides). A RADICALLY NEW TEACHING APPROACH which keeps text minimal and dispenses with the usual rote learning. All-In-One music theory exposes simple rules and patterns, enabling students to work things out for themselves, providing an in depth knowledge of music theory with minimal effort. Frees up valuable lesson time for the instrumental work it supports. Contains fun and highly original games which appeal to students of every age and clear explanation ‘why’ rules and conventions exist (not just what). Please note that this book is both an explanation, workbook and reference book in one handy manual, containing all the practice material you need (some other music theory books do not contain practice material). All-In-One music theory is self-explanatory and easy to understand. Complete without the need of a teacher! 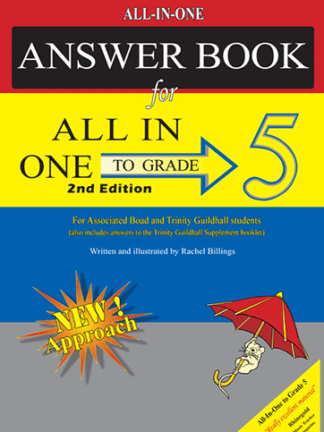 See the Review page to read what the professionals themselves have to say about All-In-One to Grade 5. Knowledge of music theory is essential for any instrumentalist (with good reason the ABRSM will not permit anyone to take a practical exam on their chosen instrument past intermediate level, unless they first have Grade 5 music theory). 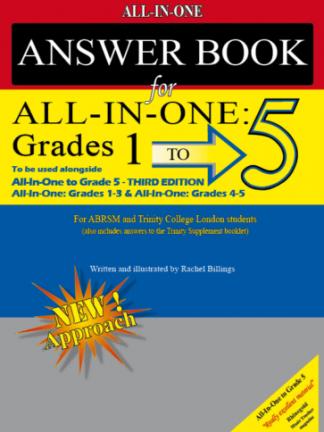 All-In-One presents a highly memorable method which is suitable for all ages, freeing up valuable lesson time for the instrumental work it supports. ‘Fast-track’ is the consequence of a proper and in depth understanding which avoids the traditional, time consuming rote learning. Click here to read about the importance of learning music theory. Please CLICK HERE to see a complete list of shops that stock our All-In-One music theory books. Aaron Publications at Rhinegold’s Music and Drama Education EXPO 2018 ! 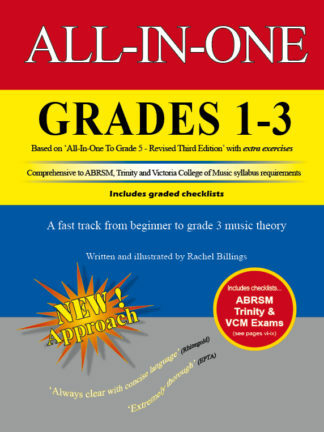 All-In-One Music Theory is Endorsed by Victoria College of Music Examination Board! “…Really excellent material”… “Presented quite differently from most other music theory books”.. “Good psychology to encourage and inspire”……”The book is always clear, with concise language so that pupils of any age should be able to work through it with minimum dependence on the teacher.” “Lots of puzzles and games” …”Note recognition is mostly done through a story in which words are depicted in notation and have to be deciphered for the sense of the story to be revealed – an imaginative touch”… “Pattern recognition…[to] help faster note reading”…. “Crosswords, anagrams and stories using Italian and French words [performance directions] are really excellent material for making the learning of musical terms enjoyable and successful.The book is worth every penny just for this section alone“(Rhinegold Music Teacher magazine Feb 2009). “… written in a clear and inviting manner which should appeal to all ages other than the very young… extremely thorough; also entertaining enough to encourage all but the most obstinate…. Even when all the many exercises are completed, it is not a book to be thrown away as we frequently dispose of other completed exercise books.It will remain as an excellent source of reference and one which I can warmly recommend”. 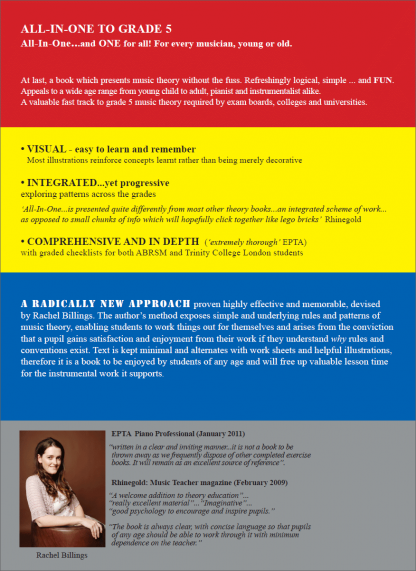 EPTA review (in piano Professional), Spring 2011. We have a selection of sample pages that we have made available for you to download. Please ‘click here‘ for further information.